To purchase a DVD of After Coal Scroll down for more information. License is good for five public screenings hosted by the purchasing university/college, K-12 school, institution, or business. Purchase includes After Coal film on DVD, discussion guide, and library license for purchasing institution. Duration: 48 minute and 56 minute cuts. NTSC, region 0. Contact us to make special arrangements or with questions about the licensing. License is good for five public screenings hosted by the purchasing non-profit organization. 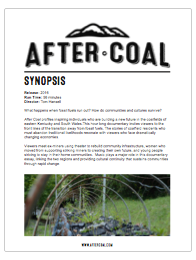 Purchase includes After Coal film on DVD and discussion guide. Duration: 48 minute and 56 minute cuts. NTSC, region 0. Contact us to make special arrangements or with questions about the licensing. Purchase of a home use DVD is for personal use only. Duration: 48 minute and 56 minute cuts. NTSC, region 0. Contact us to make special arrangements or with questions about the licensing.